Fri, Jan 18, 2019, 12:45 pm SL Time, ColomboPage News Desk, Sri Lanka. Jan 18, Manila: The Speaker of the House of Representatives of the Philippines has said that the Parliament of the Philippines will extend fullest support to implement the program for development cooperation with Sri Lanka proposed by the Philippines President, with the aim of assisting Sri Lanka. 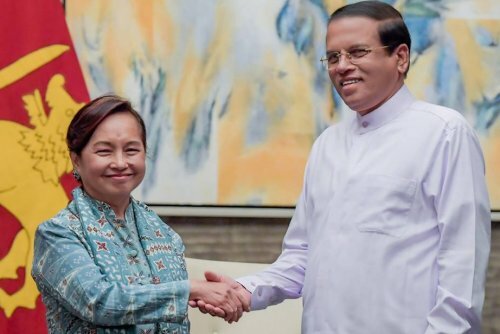 The Speaker and the former President of the Philippines Gloria Macapagal-Arroyo, made these remarks when she met with visiting Sri Lankan President Maithripala Sirisena Thursday (17) in Manila. During the meeting, President Sirisena, recalling the steps taken to further strengthen the diplomatic relations between the two countries at the discussion with Philippines President Rodrigo Duterte, emphasized that the assistance of the Philippines Parliament is required to achieve success in the initiatives. During the meeting between the two leaders, it was also discussed to establish Philippine Embassy in Colombo, to take forward the relations between the two countries in a broad manner, and President Sirisena assured the Speaker that he will take steps to locate a land in Colombo for the embassy. President Sirisena commended the Philippine government for combating the illegal drug trafficking. He said that the drug menace is the biggest hurdle to develop the country and urged cooperation from the Philippine government for Sri Lanka's fight against illegal drug trafficking. President Sirisena also met with the President of the Philippines Senate and held discussions.